Truly a “K Street Classic”, the historic DC Hay Adams hotel, located just between the White House and K Street is home to arguably one of the best power-lunch spots in town. Head downstairs to their secluded, dimly lit basement bar and lounge Off the Record if you seek encouragement prior to your big lunch, otherwise, as you enter the lobby, tun left and admire The Lafayette. Risen above the main lobby level up a handful of stairs is the high ceiling, white table clothed room being lit by large chandeliers. 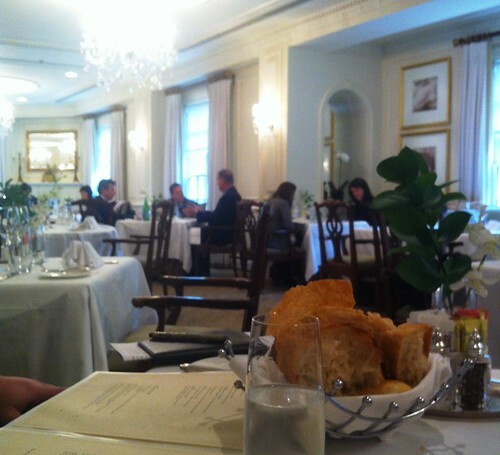 Bustling and attentive waiters move quickly and quietly around the hushed dinning room, where CEOs of Fortune 50 companies, politicians, White House officials, and DC power brokers dine on Black Angus burgers smeared with foie gras and Maryland style crab cakes. Often intermixed are the occasional hotel guest in jeans and a tucked in Oxford, and why not? After all, the best part, second to the food quality and exceptional service, is the affordable price point one finds amidst all this luxury. A light lunch here, sans adult beverages, can be easily done under $30 per person. 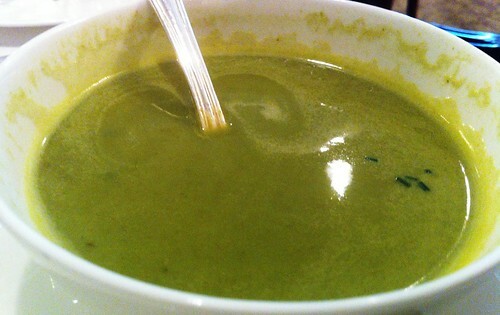 To start, inquire about the soup of the day, freshly prepared in house obviously. Our option was a pureed vegetable soup with chicken broth and a touch of cream, strained at least three-thousand times, well, perhaps not. But the texture was that of silk, perfectly smooth and light. Always on the menu is the marinated asparagus starter. Served with six perfect asparagus stalks cooked just slightly enough to give them a small amount of wilt, but retaining their firm structure and texture. 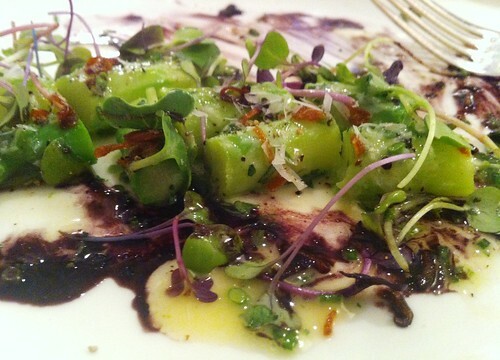 This dish is topped with shaved Parmigiano Reggiano, crispy shallots, and exceptional olive oil and balsamic, with micro-greens in a black olive sauce. If you’re not hungry enough for a full lunch entree, the starter Maine lobster salad is perfect – even better when paired with a crisp white wine. 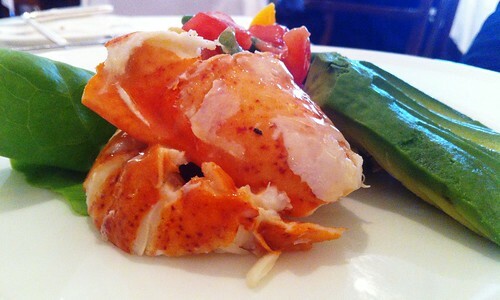 Perfectly poached, sweet, and delicate lobster meat is served over sliced avocado and heirloom tomato, paired with green beans, with a lime and coriander emulsion. Perfection on a plate. The crab cakes are a staple, as is their potato gnocchi served with roasted squash, English peas, and pearl onions, in a basil pesto. However more often than not, the perfectly seared Branzino calls your name. Three large portions of seared Branzino with crispy skin served over a bed of artichokes, morels, bok choy, in a large bowl with a light and crisp Kaffir Lime broth. 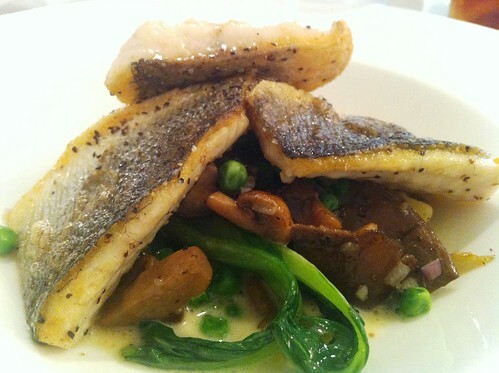 The sweetness of the Branzino and the tartness of the broth pair perfectly together. With an ideal lunch behind you, leave on a classic note. If dessert is an option, then you’re ordering their classic fresh seasonal berries. Period. 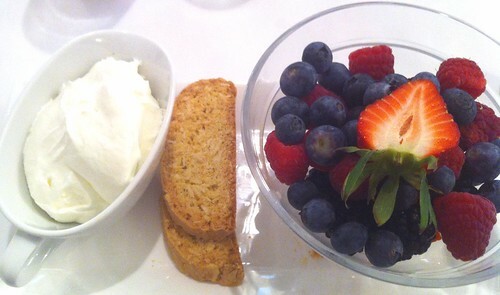 Served in a more than generous portion (and often ordered for breakfast as a meal), the berries are paired with a housemade Chantilly cream and a citrus biscotti. Light, refreshing, and a perfect way to end a meal.